A stuffy nose can be one of the most annoying things you have ever experienced. It deprives you of your normal breathing. You feel like there is something stuck in your nose and then you try to blow it hard to breathe again but nothing comes out. Consequently, it makes you feel irritated and even makes you sound absolutely funny. Then you end up spending a lot of your time with the lingering thought about your stuffy nose. In short, it distracts you largely from your daily life. 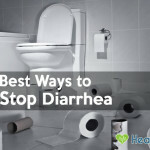 Therefore, if you ever experience such thing, make sure you follow the tips below on how to get rid of a stuffy nose fast and get everything back to normal as fast as possible. First of all, in order to get rid of the stuffy nose, we should get down to what really is a stuffy nose and what causes it. Before you go to sleep or before you have your breakfast, try chewing a few basil leaves, about 3 or 4 leaves is enough. In case you are not interested in chewing them, try grinding them and consuming those basil leaves with tea. Boil the sliced ringer roots with low fire for around 20 minutes. Then soak a piece of cloth into this liquid and apply it over your face for 15 minutes while relaxing. The anti-inflammatory properties in ginger will reduce your stuffy nose. 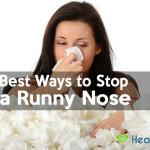 This is one of the most effective ways to deal with congestion nose. The moisture and the heat from the steam will ease your nose remarkably. Put some kinds of herbs such as peppermint, thyme, chamomile into a bowl of boiling water. Next, put a thick blanket all over your head and lean over that bowl and inhale the steam for a few minutes. Hot soup is such a delicious way to heal your nose. Soup that contains a lot of vegetable, lentil or chicken is recommended. Inhaling the aroma of peppermint or eucalyptus can clear the blockage in your nose much faster. Staying hydrated is a key factor to get over the stuffy nose. It is always helpful to drink warm tea with ginger or rosemary when you suffer from a congestion nose. As mentioned, drinking warm fluids is very helpful for stuffy nose treatment. 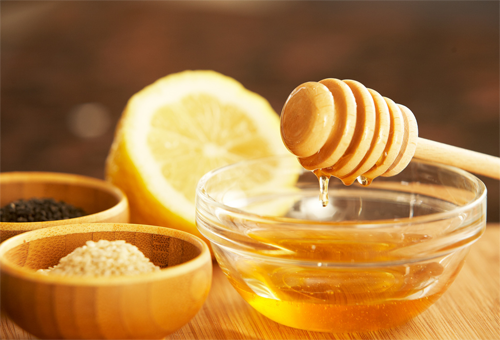 Sipping a glass of warm water with 2 to 3 spoons of honey seems like a perfect way to relax and reduce the blockage. If you like milk, it is also ok to drink milk with honey. Twice or 3 times a day, drink warm water with 2 teaspoon of apple cider vinegar to ease your nose more quickly. Use your fingers to put the mustard oil into your nostrils 2 or 3 times a day. If possible, eat food which contains mustard oil. There are lots of things you can do with lemons. You can either drink lemon juice, make lemon ginger tea or make it into a mixture with salt and black pepper powder to use around the nasal area. Though it may sound a little bit stinky to many people, eating fresh garlic (about 1 or 2 cloves at a time, twice a day) does prove to help a lot with stuffy nose treatment. In case you cannot stand the smell of raw garlic, try to make some food such as soup with garlic. Sip on 2 glass of hot tomato juice a day can help a lot. Remember to add a pinch of salt and some chopped garlic into the juice for much better result. Make warm liquid of water and salt and let this liquid into your nostrils with the help of a neti pot. Put Fenugreek seeds into a pot of water and boil it. Drink this kind of warm liquid a few times a day to feel relief in your nose. 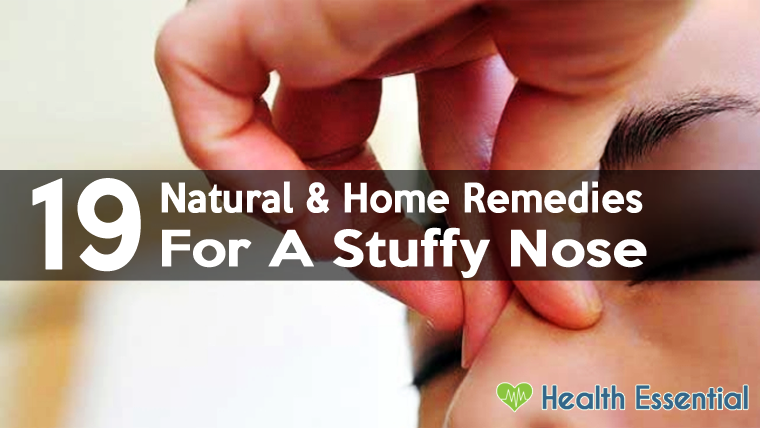 Get salt water deep in your nostril to heal your blocked nose. 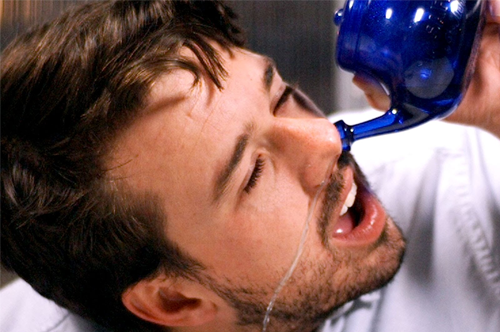 You can utilize some devices such as the neti pot to do this. Salt water rinse is always cheap and effective. Steam with heat and moisture can remove the blockage. Make sure you do this twice a day before you go to bed and in the morning. Eating hot and spicy food together with warm drinks are the best during the days of stuffy nose. There are some kinds of food you should stay away like wheat, grains. Etc. As humidifier adds extra moisture to the air, it helps curing the blockage in your nose. However, remember not to overuse it, particularly if you are living in such a damp area. There are cool-air and hot-air humidifier available on the market. 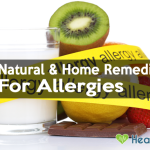 It is such a simple way to deal with stuffy nose and especially, it costs absolutely nothing. You just need to be patient and message your sinuses every day. You can use your index fingers to massage the sinuses around your nose and eyes, 20 to 30 seconds each. Then, do not forget to do the same with your cheekbones with your thumbs. In some cases, a stuffy nose can be a sign of something much more serious, such as upper respiratory infection, bronchitis, pneumonia, or allergies. It may also lead to problems with ears and speech and is extremely dangerous in infants. If your nasal congestion lasts for more 14 days and if it particularly comes with headache, earache or problems with the eyes, make sure you contact your doctor right away for immediate further treatment. Above are our advices on How to get rid of a stuffy nose. 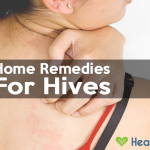 Hopefully, they can help you say goodbye to this kind of nuisance as soon as possible.